At last, I found the answer to the one burning question that your mother has been asking me repeatedly over the past few weeks. She even stuck a giant post-it note on my desk while you guys are away on vacation in Malaysia. “What are you teaching your children?”, she wrote. I guess she has always felt that there is a lot that I know which would be beneficial for you both. And I’m guilty of not spending time to impart them to you. 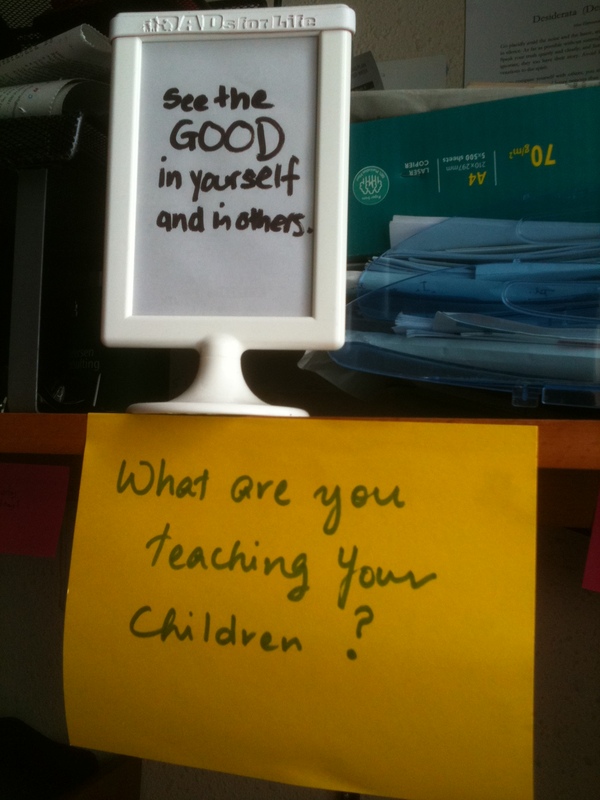 Alright, let me start with my new found mantra for 2012: BE GOOD, DO GOOD. I suspect it came from the words I wrote some months back, framed in the cheap IKEA picture holder that has been sitting on my desk all this while. It’s kinda funny that sometimes, the answer that we hunt high and low for is staring right at our faces (the same thing happened when I found the love of my life – am saving that story for another day). You are here to manifest goodness – possibly in ways that are unique to you. Who you become, what you do, how you do it, and who you serve, is all up to you. But above all, be guided by a simple principle: be good, and do good. Being good begins with seeing the GOODNESS in yourself and in others. Look, and you shall see. And when you fully embody the goodness you see, you will naturally do good. Who you are being shapes your doing. It’s as simple as that. Now, give it a try. You don’t need to wait till existential crisis hits you. Be good, and do good to someone today.